Singer Miley Cyrus, fiancé Liam Hemsworth and their puppy Ziggy already look like one big happy family. Liam tweeted a new photo of the trio recently with the message, "Life is amazing." The English bulldog, a birthday gift from Miley to Liam in January, is one of the couple’s four pups. Rounding out the brood are Lila, Floyd and their latest addition, Happy. Miley rescued the Rottweiler and Beagle mix after he was abandoned outside of a Walmart! Ziggy stole more of the spotlight on Cyrus’ Twitter page when she posted a post-meal pic of the doggy. 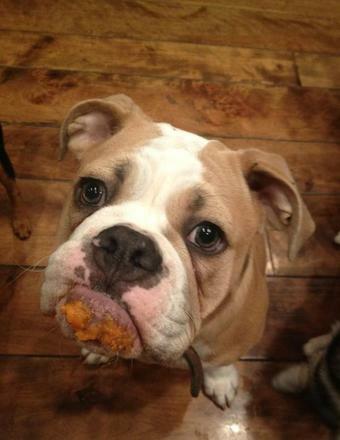 “The little fatty lovvvved her pumpkin :) thxxx auntie E!” she tweeted to “The City” star Erin Lucas.